SCOTT -- Fire protection services for the city of Scott are set for a range of improvements over the next year that include upgraded water lines in the downtown area, incentive pay for volunteer firefighters and hiring the city’s first fire inspector. About 9,000 feet of old and undersized water lines will be replaced in early 2016 on Alfred, Lafayette, Scott, St. Mary and Victoria streets, where aging, leaky water lines measure a paltry inch to an inch-and-a-quarter wide, Scott Fire Chief Chad Sonnier said. New 6-inch lines will improve water pressure not only for regular water users, but provide enough pressure for the Fire Department to install 15 hydrants in the area, which previously didn’t have enough water pressure to sustain any hydrants. Without fire hydrants to serve the downtown area, firefighters relied on portable, 3,000-gallon water tanks, Sonnier said. The state in March awarded Scott a grant of up to $467,600 to upgrade the lines. At its May 7 meeting, the Scott City Council gave Mayor Purvis Morrison authority to move forward with the upgrades. Construction should begin by January 2016, with the project anticipated to take about 4 to 5 months, said Pat Logan, Scott’s comprehensive plan facilitator. Civil engineering firm Grooms Engineering will begin drawing the plans in coming weeks and the design and bidding phase is estimated to take about six months. A March 2011 evaluation from the Property Insurance Association of Louisiana rated Scott’s water system as a 23.10 on a scale of 35 — a number that could improve once construction is completed. The council at its May 7 meeting also approved the creation of a Fire Protection Bureau, which will employ a part-time fire inspector who will also lead fire safety outreach efforts. Scott currently relies on the State Fire Marshal’s Office to conduct inspections, which often means longer wait times for new and existing businesses to undergo the routine. “Our inspector can go in and do an inspection so that business can open up quicker,” Sonnier said. The part-time employee will work 32 hours a week and make just under $30,000 a year once he or she begins work after the start of the next fiscal year on July 1. The Fire Department is also in the process of budgeting tens of thousands of dollars to pay incentives to its volunteers. The city’s 32 volunteer firefighters are held to the same standards as its six paid, part-time firefighters, but they don’t receive money for their time or gasoline. “They’re actually losing money,” Sonnier said. The incentives mark an effort to increase the number of volunteer firefighters, which is decreasing both locally and nationwide, Sonnier said. Although the plans aren’t finalized, Sonnier said, he anticipates having $50,000 to $75,000 to use for the incentives, with about two-thirds of the funds coming from the department’s $302,000 budget and the rest from about $30,000 to $40,000 in donations and fundraising dollars the department accrues each year. Lafayette Consolidated Government budgeted just over $88,000 for the department this fiscal year for its work supporting unincorporated areas of the parish that are hurting for active volunteers and are at risk for lowered fire ratings. The improvements in Scott will at least have “a direct impact” on the city’s fire rating, likely improving it from “a weak 3” to “a stronger 3,” said Sonnier, whose work as fire chief is done on a part-time, volunteer basis. 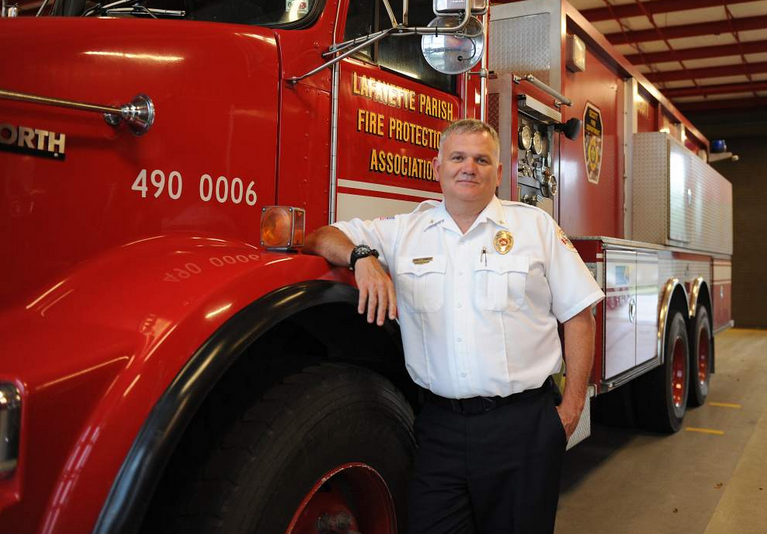 He’s also a career firefighter for the Lafayette Fire Department, which has the only full-time firefighting force in the parish. The unincorporated areas of the parish — like neighboring Judice, which relies on the Scott Fire Department for services — have only volunteer forces and a fire insurance rating of 5, compared with a 2 for the city of Lafayette and a 4 for Broussard, Carencro, Youngsville and Duson. Improvements to both the fire and water ratings can lead to lower homeowner’s and property insurance costs. The Lafayette City-Parish Council will vote Tuesday whether to provide funding and worker’s compensation coverage for two part-time positions within the Judice and Milton volunteer departments and one part-time position at Duson’s. Follow Lanie Lee Cook on Twitter, @lanieleecook, or contact her by phone at (337) 534-0825.